As agreed by China and the Arab states, the 8th Ministerial Meeting of China-Arab States Cooperation Forum will be held on July 10 in Beijing. State Councilor and Foreign Minister Wang Yi, foreign ministers or representatives from the Arab states and Secretary-General of the League of Arab States will attend the meeting. At the meeting, the relevant parties will have comprehensive and in-depth discussions on further consolidating the traditional friendship between China and the Arab states, advancing the Belt and Road Initiative, jointly building a new type of international relations and forging a community with a shared future for mankind, enhancing the mechanism building of the China-Arab States Cooperation Forum and other international and regional issues of common interest. 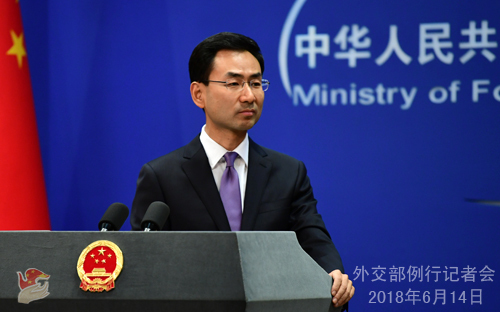 At the invitation of State Councilor and Foreign Minister Wang Yi, Minister of Foreign Affairs Anders Samuelsen of the Kingdom of Denmark will pay an official visit to China from June 20 to 22. During this visit, Yang Jiechi, member of the Political Bureau of the Communist Party of China (CPC) Central Committee and Director of the Office of the Foreign Affairs Commission of the CPC Central Committee will meet with Minister of Foreign Affairs Anders Samuelsen and State Councilor and Foreign Minister Wang Yi will hold talks with him, during which they will exchange views on bilateral relations and issues of mutual interest. Besides Beijing, Minister Samuelsen will travel to Shanghai. Denmark is one of the first western countries to establish diplomatic ties with China. This year marks the 10th anniversary of the China-Denmark comprehensive strategic partnership. We believe that Minister of Foreign Affairs Anders Samuelsen's visit to China will help step up political mutual trust, expand our practical cooperation across the board and elevate China-Denmark relations to a new level. Q: According to reports, US President Trump today is expected to have a meeting with his senior trade advisers to finally set the tariffs on Chinese goods, and the decision is expected to come out tomorrow. Is China prepared to win a trade war or are you confident that you can win it? A: We have said many times that the China-US economic and trade ties are win-win cooperation in nature. We always believe that the two sides should, on the basis of mutual respect, equality and mutual benefit, engage in dialogue and consultation to properly resolve the relevant economic and trade issues, bridge the differences, expand cooperation and deliver benefits to our two countries and two peoples. Early this month, US Secretary of Commerce Wilbur Ross led a delegation to China for consultations, which achieved positive and concrete progress. You may still remember that a statement was issued by the Chinese side after the trade talks. The statement says that none of the economic and trade outcomes of the talks will take effect if the US side imposes any trade sanctions including raising tariffs. Hereby, I would like to reaffirm this point. 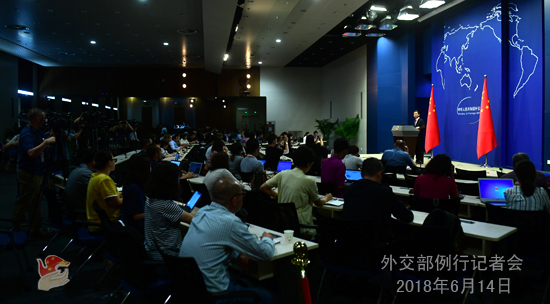 Q: According to Japanese media reports, Japanese businesses recently have stepped up their efforts to climb aboard the express train of China's Belt and Road Initiative. With the increase of the China-EU freight trains, some Japanese companies have launched freight transport services linking Japan and Europe via China, which will help export more Japanese products to Europe. In Poland and other countries along the Belt and Road, Japanese enterprises have also expanded equipment and technology exports through bidding for and conducting infrastructure projects. What's your opinion on that? A: We have seen relevant reports. They have shown that an increasing number of Japanese businesses are translating their readiness to engage in the Belt and Road Initiative into concrete actions, and more and more people in the world are fully confident in the prospect of the initiative. China always remains open to Japan's participation in the Belt and Road Initiative. In terms of conducting cooperation in third-party markets in particular, China and Japan enjoy notable complementary strengths. The two sides' cooperation in this regard will not only help expand China-Japan economic and trade cooperation, but also be conducive to the economic development of the third parties. Not long ago, the two sides signed the China-Japan Memorandum of Understanding on Third-Party Markets Cooperation and decided to set up an inter-agency working mechanism to promote China-Japan cooperation on third-party markets. We believe this will provide better institutional guarantees and an effective platform for Chinese and Japanese businesses to conduct cooperation on third-party markets. We support businesses in our two countries in achieving more cooperation outcomes regarding third-party market cooperation under the framework of the Belt and Road Initiative, bringing benefits to the two peoples and realizing win-win results and mutual benefits. Q: Just now you announced that the 8th Ministerial Meeting of China-Arab States Cooperation Forum will be held next month. What new achievements have been reaped in terms of mechanism building since the last meeting? What policy measures will the Chinese side announce regarding the Arab world at the upcoming ministerial meeting? A: Over the past two years, the institutional activities under the China-Arab States Cooperation Forum have been advanced smoothly. The Senior Officials' Meeting, the Strategic and Political Dialogue at the Senior Officials' Level, the Seminar on China-Arab Relations and China-Arab Civilization Dialogue, the China-Arab Energy Cooperation Conference and the China-Arab Friendship Conference were held successfully. The cooperation consensuses under the framework of the forum have been implemented. We have established the China-Arab Research Center on Reform and Development, launched the Joint Training Program for Chinese-Arabic Translators and held the China-Arab States Beidou Cooperation Forum, Anti-extremism Roundtable and the China-Arab Forum for Development and Reform. The cooperation of the forum has been extended to cover such areas as post-war reconstruction, talents training, women exchanges and high-tech cooperation in more dimensions. At the upcoming ministerial meeting, we are willing to further strengthen communication and coordination with the Arab states, jointly champion mutual respect, fairness and justice and win-win cooperation and continue to play a positive role in upholding and promoting regional peace, stability and development. As far as I know, our two sides are stepping up consultations on relevant cooperation documents. We stand ready to enhance cooperation on production capacity, post-war reconstruction, humanitarian development and cultural and people-to-people exchanges with the Arab states under the framework of the Belt and Road Initiative and better support their efforts for national transformation and economic diversification. Q: US Secretary of State Mike Pompeo reportedly said that economic sanctions on the DPRK will not be eased or lifted until the denuclearization is realized. Does China agree with the US? A: I kept stating China's position on this issue most recently. I would like to reiterate here that sanctions per se are not the end. All parties should lend support and cooperation to the current efforts for diplomatic talks and denuclearization of the Korean Peninsula and promote the political settlement process. Q: You just said that none of the economic and trade outcomes reached in negotiations between the two sides will come into effect if the US takes trade sanction measures, including imposition of tariffs. Apart from that, will China take other countermeasures? A: I would like to repeat the line in the statement for you: none of the economic and trade outcomes of the talks will take effect if the US side imposes any trade sanctions including raising tariffs. What we're talking about here is "all the economic and trade outcomes". As to the unilateral measures taken by the US against China, we have stated our position on that on many occasions. I believe we have made it very clear. 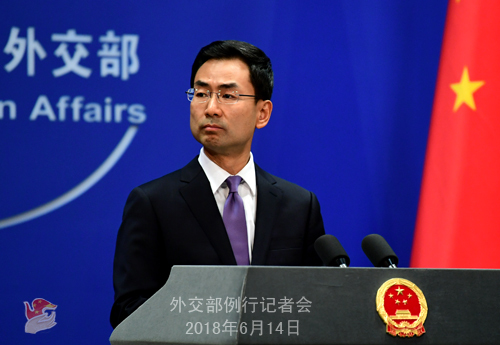 Due to scheduling reasons, the regular press conference of the Foreign Ministry on June 15 will be held at 2:00 p.m. at the same venue.